It's been said that we live in a golden age of reprints, and there is indeed an amazing amount of material available. That does take up a not insignificant amount of physical space; however, much of it is also available digitally. Which makes access to older stories infinitely easier than it used to be. I was musing, though, on the microfiche reader I picked up several years ago, and the 100 or so old 1940s comics I have on microfiche. The technology itself is old, and had already been around in some format for decades when it started to become commercially viable in the 1920s. But what's interesting is that was really only about a 10-15 year window where selling microfiched comics was a financially viable endeavor. Working backwards, it's easy to see that the proliferation of the internet would have pretty well killed off whatever market was still around ten years ago. For the 5-10 years before that, there was a weird mix of models available. Some folks were trying to host stuff online, but internet speeds were too slow to make that a good option for anyone but the very patient. CD-ROMs were tried but you would run up against size limitations -- I have the first 500 issues of Amazing Spider-Man in this format and it's a dozen discs which, while not an unmanageable number, is still kind of awkward and tedious if you're trying to read a story that might run from one disc to another. 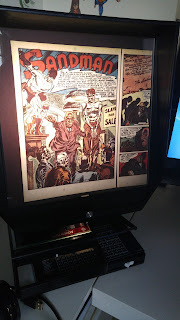 Before that, in the absence of a robust reprint program, the only other real option for reading old comics was microfiche. However, the potential audience for such material -- comic fans that had a few hundred dollars to drop on a reader and some comics -- probably didn't reach anything resembling a critical mass for commercialization until the mid-to-late 1980s. Microcolour, the place where I got all of my microfiche comics and materials, was started in 1988. I don't know exactly when they began adding comics to their catalog, but there's a "Collectors' Alert" on their site that implies that they only first began doing comics with that notice -- a PDF with a 1997 creation date. Their list of available comics has a 2003 creation date, and I received notice in 2007 that their film supplier had dried up. Their website doesn't seem to have been updated since 2011, although the domain name itself was renewed last August so they don't seem to be out of business. But it points to this very limited window of time that the company really worked in, just as the last vestiges of the analog world were giving way to the digital one. It somehow seems emblematic of the general chaos the comic industry was in during the late '90s and early '00s. Nice. I'm also reminded of my impressions of photo typesetting (another form of information-on-film), when I did a research project in college. It felt like a technology that never really had a substantial era of its own, before digital methods replaced it. Although I have found myself looking at microfiche in the course of research for one or another book, now and then. In every case I have done so, I'm fairly certain that the same periodicals have been scanned and placed in web-accessible archives… but they come with a fee and I may find myself at a library which does not subscribe but does have the old rolls of film. Some of these comics are still only available on microfiche. I have no idea why many of them were chosen initially, but for whatever reason(s), many haven't made the transfer to digital OR a reprint yet. I probably wouldn't have any continuing interest if I hadn't picked up a reader and all those comics when I did. The company seems to still have some comics available, just not any Marvel or DC titles. I should probably try snagging some of the more obscure titles while they're still around. Not sure if/when I'll be able to get around to transferring those CD comics, though. My wife's desktop still does have a player, so I can copy files off them easily enough, but I've actually got around 50 discs' worth, so it would take quite a bit of time. Not to mention that I've got print versions of many of those comics already, so it's been a little hard for me to justify.